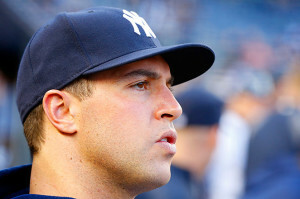 The New York Yankees placed first baseman Mark Teixeira back on the 15 day disabled list general manager Brian Cashman said Monday. Teixeira was pulled from the game on Saturday at Los Angeles at his request with a sore wrist. Later that day Teixeira headed back to New York to consult with Yankees team physicians. Teixeira received a cortisone shot and will be reevaluated next week. He was diagnosed with inflammation in his right wrist although not directly related to the issue that put him on the disabled list for the first two months of the season. Teixeira is hitting .151 in 15 games since he came back from the DL. Lyle Overbay will take over at first base as long as Teixeira is out.